In the second half of the 19th Century, The Kingston Daily Freeman and New York City newspapers hailed the growth of the bluestone trade in Ulster County. At the same time, these newspapers demonstrated a loathing aversion both to the Irish laborers who worked the quarries, as well as to the Democratic leaders of the old Town of Kingston. Why was there so much resentment against the Irish and why did the newspapers wage a journalistic crusade to rid the county of any Democratic party influence only in the old Town of Kingston and not in any of the other towns that voted the Democratic line? 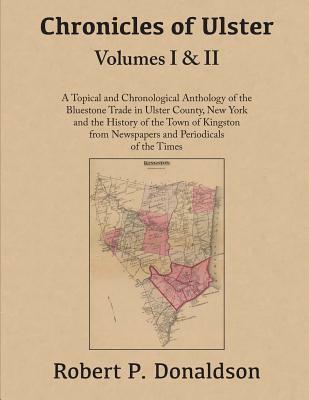 Relying on information from 19th Century news articles, mostly from The Kingston Daily Freeman, New York City and Port Jervis newspapers, state journals, articles found on the internet, along with records from the Town of Kingston and Ulster County archives, Volume I of this anthology explores the origin, growth and decline of the bluestone industry in Ulster County, New York, including information about the people who developed the bluestone trade, as well as those who worked the quarries. Volume II of the anthology covers the history and people of the old Town of Kingston (Stony Hollow and Jockey Hill) primarily between the years 1860 - 1900. In an age where newspapers led the crusade against party machine politics, Chronicles of Ulster relies on numerous newspaper reports on the political and economic issues that pitted Republicans against Democrats. The chapters cover the political issues, election fraud, clashes in the towns and at the polls, investigative hearings, trials and legislation from Albany that were instrumental at bringing about the change in the physical structure and leadership of the old Town of Kingston. The author challenges the accuracy and veracity of many of the newspapers' stories of the issues and events during that era; stories that evolved into the legends many still believe to be true about the old Town of Kingston. Robert Donaldson is a graduate of Marist College and the SUNY at New Paltz. He is retired from Rhinebeck High School where he taught law and European History. At Dutchess Community College, he was an adjunct instructor in law and legal research in the paralegal program. He lives with his wife in the Town of Rhinebeck.